Ant-Man and the Wasp: Is Thanos in the Quantum Realm? If the rumors coming out of Ant-Man and the Wasp are to be believed, then we might be seeing the nefarious Thanos again sooner than we thought. The Mad Titan, played by Josh Brolin, hasn't been expected to return to the big screen until 2019's fourth Avengers movie, which some seeming leaks have indicated might be called Avengers: End Game. But according to reports both inside and outside of Marvel Studios, the Gauntlet Daddy might just be lurking in Ant-Man and the Wasp's Quantum Realm, if you squint hard enough to notice him. The rumor is fueled chiefly by two distinct things: Eyewitness reports from people who have seen the movie, and a telling hint from director Peyton Reed and Marvel Studios president Kevin Feige. The Quantum Realm is, of course, the micro-sized universe within the Marvel Cinematic Universe that is only accessible via extreme acts of personal shrinkage. The pico-sized dimension was previously glimpsed in the first Ant-Man movie, when Scott Lang shrank himself without an active regulator. While he was there, the filmmakers inserted a blink-and-you'll miss it image of the original Wasp, aka Janet van Dyne, who would ultimately end up being portrayed in the sequel by Michelle Pfeiffer. According to Feige and Reed, speaking in an interview with io9, the filmmakers sneaked another groundwork-laying Marvel Comics reference into the background of the Quantum Realm in Ant-Man and the Wasp. While the duo didn't share what the reference was, they did indicate that it was as hard to spot as the Wasp was in the first Ant-Man. "Like the first movie there are clues in the Quantum Realm to other possibilities and things," said Feige. "I'm talking frames." "We have definitely laid some groundwork for some stuff down there… similar to what we did in the first movie," Reed added. Now, we say all of that to say this: According to reports of people who have seen the movie, at least one of the Quantum Realm Easter eggs is the unmistakably wrinkly mug of Thanos himself. The Ant-Man sequel sees Scott Lang returning to the Quantum Realm in order to search for Janet, who has been lost inside the microverse for decades. 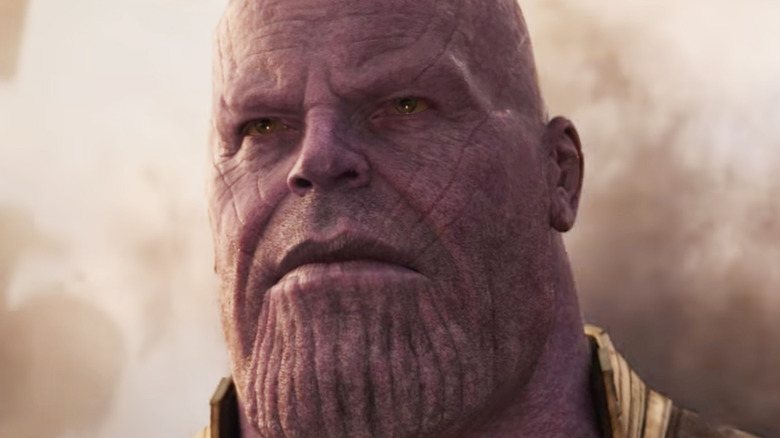 As pointed out in multiple posts on Reddit, some viewers swear they can see Thanos' face there, specifically during a — and again, this is potentially an end of the movie spoiler for you — post-credits scene. One viewer even posted a blurry screenshot of the supposed sighting, which is… oh, we'll say halfway convincing. There's some eyes in there. But what does it mean? If the reports are to be believed, then it's hard to say what Thanos' appearance in the Quantum Realm might indicate. Reportedly, his appearance takes place during a scene in which Scott is back inside the Quantum Realm, with Hank, Hope, and Janet guiding his journey as they remain in the normal-sized dimension. While Scott is away, the effects of Thanos' universe-halving snap from Infinity War kick in, dusting the Pym/van Dynes and leaving Scott trapped inside the dimension that Janet was lost in for so long. Of course, while it's possible that this Thanos talk is wishful thinking, it's unquestionable that Feige and Reed have said that there's something inside the Quantum Realm worth keeping an eye out for. For our money, Thanos is more likely of a sighting than, say, Wolverine — but who knows. Maybe Marvel's reaching across the aisle to Paramount and getting the Micronauts in here. That sounds fun. Movies are fun! Ant-Man and the Wasp is crawling (and also buzzing) its way into theaters today. The next movie in the MCU to look forward to following Scott and Hope's Excellent Adventure is the Carol Danvers-centric Captain Marvel, set to hit theaters on March 8, 2019, which will promptly be followed by Avengers 4: The Fourth Avengers on May 3.